Natural product modified organocatalysts have gained attention due to their environmentally benign and biodegradable nature and as a result, these are now becoming powerful tools for the construction of simple to complex molecules with new concepts and designs. In the recent past, Camphorsulfonic Acid (CSA) has gained considerable attention as an efficient organocatalyst for the synthesis of various organic scaffolds with potential pharmacological interest. Camphorsulfonic acid (or Reychler’s acid) is inexpensive, commercially available, stable, non-toxic, reusable organocatalyst which can catalyze a variety of organic transformations such as many multi-component reactions, organic named reactions and the synthesis of various biologically promising heterocyclic compounds. 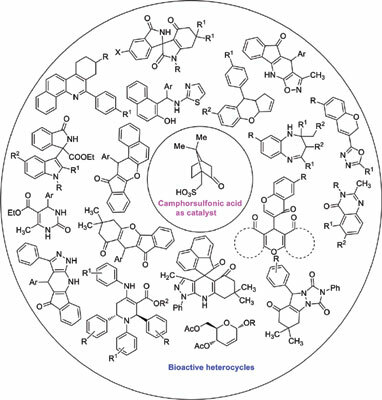 The present review summarizes the camphorsulfonic acid-catalyzed synthesis of bioactive heterocycles reported so far. Camphorsulfonic acid, reychler's acid, organocatalyst, organic synthesis, bioactive heterocycles, piperidines.